With every article ever written on strength of schedule, one must always start with the following caveat: There’s a lot of variance in this data. So much changes year-to-year and team-to-team. A defense’s weakness last season may now be its strength after significant free agency and draft acquisitions. Or, perhaps that defense’s vulnerability was the result of a defensive scheme that no longer exists following a coaching change. Still, with these caveats in mind, strength of schedule is something I spend a good deal of time on each season. My methodology for this exercise was simple. 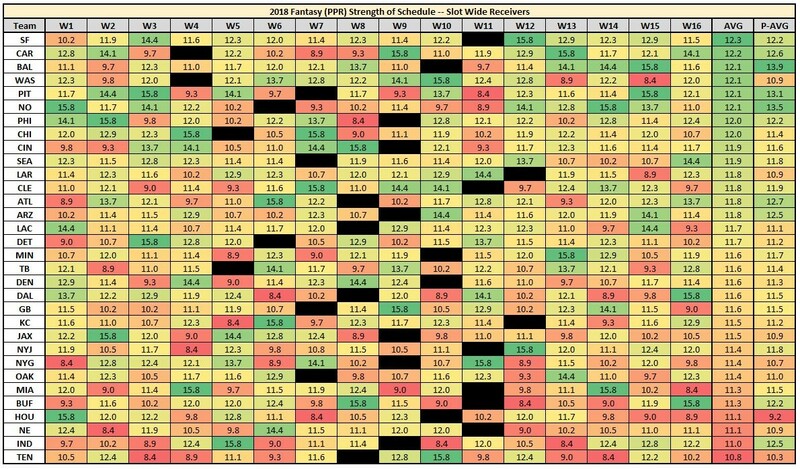 I looked at the 2018 schedule for each team and replaced each opponent with their 2017 fantasy-point-per-game average allowed to opposing slot wide receivers. This should paint a decent picture of the season as a whole, a team’s fantasy postseason schedule (P-AVG), and weeks to stream or target players in trade. I’ll also try to close some gaps with the analysis written below. Here is how each schedule has improved in contrast to 2017. Considering there were only 13 wide receivers to run at least 40 percent of their routes from the slot and rank among the top-36 in fantasy points per game last season, I decided to just highlight the schedules for teams I felt were most relevant. For instance, I didn’t think players like Trent Taylor and Russell Shepard were worthy of a deeper dive, despite having an attractive schedule. So, here’s who stood out to me. Baltimore Ravens – Baltimore has our third-easiest schedule for slot wide receivers, which should bode well for the newly acquired Willie Snead. Snead was largely neglected by New Orleans last season, following a three-game suspension to start the year. Snead was never targeted more than three times in any game last year but did rank 34th and 32nd in fantasy points per game in the two seasons prior. Impressively, he was also our 11th-highest-graded wide receiver in 2016. Baltimore has our fifth-toughest strength of schedule for outside wide receivers, which might put a small dent in my projections for John Brown and Michael Crabtree, but Snead should be safe in the slot (where he’s run 73 percent of his routes over the past two years.) It’ll be interesting to see how Joe Flacco fares with a completely revamped wide receiving corps after a historically bad 2017 (only six quarterbacks all-time have attempted at least 500 passes and posted a lower yards-per-attempt average than Flacco’s 5.72 in 2017), but there’s little downside with Snead at his current undrafted ADP. Washington Redskins – As we outlined on Tuesday, the Redskins have our easiest schedule for outside wide receivers, but also our fourth-easiest schedule for slot wide receivers. Jamison Crowder ran 74.4 percent of his routes from the slot last season and should reprise this role in 2018. Crowder saw a decline in production last year, averaging 11.0 fantasy points per game after averaging 12.0 in the season prior (and on 0.68 more targets per game). Still, our grades suggest he’s actually improved over this stretch (and massively so), grading out 32nd at the position after ranking 85th in 2016. His ADP is fine (WR41), but there are other names within that tier that I prefer. Pittsburgh Steelers – Pittsburgh has our fifth-easiest (and fourth-most-improved) slot schedule but our third-toughest schedule for outside wide receivers. This could mean better efficiency and more targets funneled towards JuJu Smith-Schuster, who ran 58.0 percent of his routes from the slot last season. Smith-Schuster is a player I’m incredibly high on, considering how highly he ranked by a number of different metrics last year. This was also just his rookie season and wide receivers typically take a big step forward in their sophomore years. In any case, he finished 11th in fantasy points per game last year and his current ADP (ADP WR29) looks embarrassingly low in comparison. New Orleans Saints – The Saints have our sixth-easiest strength of schedule for slot WRs. They recently signed Cameron Meredith (who missed all of 2017 with a torn ACL), and did so even before losing Snead to Baltimore. Meredith will likely replace Snead in the slot, having run 52.1 percent of his routes from the slot in 2016. As outlined above, Snead was serviceable in this role up until last season. Michael Thomas was the team’s primary slot target last year, drawing 44.3 percent of the team’s slot wide receiver targets (almost double that of the next-closest wideout, Ted Ginn’s 22.6 percent). Meredith has averaged 14.0 fantasy points per game since his first career start (Week 5 of 2016), despite drawing the majority of his targets from Matt Barkley, Brian Hoyer, and Jay Cutler. For perspective, 14.0 fantasy points per game would have ranked 15th-best at the position last season. He’ll get a nice efficiency boost from the quarterback upgrade, but his ADP still feels a bit too high (WR44) despite the soft schedule. Chicago wasn’t as optimistic regarding Meredith’s medical evaluation as New Orleans was, Thomas might continue to dominate slot targets in 2018, and Sean Payton doesn’t have an extensive history of supporting three relevant wide receivers for fantasy. Philadelphia Eagles – Philadelphia resurrected Nelson Agholor’s career in 2017 by moving him back into the slot. Agholor was our single-worst-graded wide receiver in both 2015 and 2016 but finished 24th-best last season. Agholor ran 52.3 percent of his routes from the slot in his final year of college (2014) and 86 percent last year, but just 20.5 percent during his first two years in the league. He’ll have the benefit of a soft schedule this year (our sixth-easiest), that might be even softer with slot cornerback Dominique Rodgers-Cromartie unlikely to return to the Giants. Agholor finished 25th in fantasy points per game last season and feels like an obviously safe bet to beat ADP (WR45). Seattle Seahawks – Seattle has our 10th-easiest slot schedule and our 12th-easiest schedule for outside wide receivers, but I think this is an instance where the data hasn’t caught up to current rosters. Seattle’s NFC West opponents have since added top-graded cornerbacks Marcus Peters, Aqib Talib, and Richard Sherman to their rosters. This is certainly bad news for Tyler Lockett and whoever starts opposite him, but Doug Baldwin should be safe in the slot (where he ran 73 percent of his routes last season) avoiding these four perimeter cornerbacks. In fact, this should mean more targets funneled in his direction. Baldwin has been far more reliant on efficiency than volume to score fantasy points throughout his recent career. Since Week 10 of 2015, Baldwin ranks second among all receivers in fantasy points, despite drawing at least 59 fewer targets than any other receiver in the top seven. After losing Jimmy Graham and Paul Richardson in free agency, and including the schedule disparity, Baldwin could be in line for a monster season. Current ADP places him at WR12, and I’ll gladly take him there whenever I can. Indianapolis Colts – The Colts have our second-toughest schedule for slot wide receivers. As we talked about on Tuesday, it will be interesting to see if the new regime keeps T.Y. Hilton outside (where he ran 61.3 percent of his routes last season) or in the slot (where he ran 57.4 percent of his routes the season before). Indianapolis’ outside schedule isn’t too much softer than their slot schedule, but it is much easier than the season before. This will be something to monitor throughout the offseason. New England Patriots – New England has our third-toughest schedule for slot wide receivers, which might bode poorly for Julian Edelman. Edelman has played in all 16 games just twice over his career and missed all of 2017, but ranked 16th, seventh, 17th, and 16th in fantasy points per game over the previous four seasons. 2016 was also the least-efficient year of Edelman’s career, and he will be turning 32 before the start of the season, so he does carry some risk, even at his depressed ADP (WR31). Still, he’s a decent value, as is Chris Hogan (ADP WR28) with Danny Amendola (12th overall in slot receptions over the last two seasons) leaving in free agency. Hogan ran 45.5 percent and 37.2 percent of his routes from the slot over the past two seasons. Brandin Cooks also exits the team, opening up more targets for Hogan. Cooks ranked 18th in fantasy points per game last season, but Hogan actually would have outscored him if we included the postseason and excluded all injury weeks. Although the schedule is tougher than average, Edelman or Hogan have the potential to be league-winners this year. Miami Dolphins – Miami has our sixth-toughest schedule for slot wide receivers, but the situation here is murky, so I wanted to spend more time on the roster than the schedule itself. Kenny Stills, Amendola, and Albert Wilson all ran at least 45 percent of their routes from the slot last season. Stills and Wilson both now making $8 million per year, and Amendola signing a shorter contract for $2 million less per year. Miami is probably the team best suited to support multiple slot wide receivers, leading the league in slot wide receiver targets by 17 (156 total) last year, and with Jarvis Landry (64.8 percent of his routes from the slot) also finishing fourth-best in fantasy points per game. Stills scored 66.2 percent of his fantasy points from the slot last year, so I think he’ll still spend a good portion of his time there. Wilson ranks first in missed tackles forced per reception since entering the league, and I like his prospects for fantasy if given the job over Amendola. Unfortunately, Adam Gase has indicated a desire to spread the ball around, getting all three wide receivers and DeVante Parker (on the outside) involved. At current ADP, Stills is easily my favorite target (undrafted ADP), while Wilson and Amendola could be steals if one emerges as a full-time starter (though it seems likelier they’ll be used in a committee).